SO did Clare leave it behind them? Emphatically, no. The sight of Domhnall O’Donovan on his back, while all around him Clare men, women and children were leaping into the Dublin skyline illustrates the depth of courage and mettle that has been drilled into this panel of Clare men. Had there been a chink of self-doubt or self-pity, Cork would have Liam McCarthy with them this week in the southern capital. 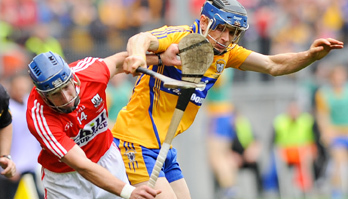 In a game largely ruled by Clare, Cork led just the once. That they did so, a minute and a half into a mere two minutes of injury time, underlines the perilous precipice on which Clare stood. Eighteen months of work was imploding before their disbelieving eyes, while decades of regret loomed. Had Cork clung on to their one-point lead, they would have snaffled a 31st All-Ireland title that they did not earn. If they win the replay, at least they will probably have to hurl for longer and better than they did last Sunday. It’s possible that this Clare panel would never have overcome defeat such was their superiority over the majority of the 70-plus minutes. Podge Collins, Conor Ryan, Patrick Kelly, Domhnall O’Donovan and Brendan Bugler hurled their way into the pantheon of Clare legends, which has made room for Anthony Daly, Seán McMahon, Jamesie O’Connor, Brian Lohan, Colin Lynch and Liam Doyle in the county’s most recent hurling history. All of the latter men hurled at their peak when it counted most, whether that was in epic provincial games or All-Ireland finals. This week, they’ve had to metaphorically shove over and make room for a new generation of mighty Clare men. Nobody was more stunned than O’Donovan at the identity of Clare’s equalising-securing titan. Yet neither was anybody surprised that the Clonara man was capable of refrigerated thinking at a time when the entire population of his native county had their head in their hands and whose thinking was frazzled at best, if indeed they were capable of thinking at all. What about Patrick Kelly’s mind-blowing bravery in the 17th minute, selflessly lending the welfare of his body for the county’s cause? Anthony Nash hit what had been a 21 yard free from much closer to the 14 yard line. Kelly faced down his Cork foe in a manner resembling Wild West veteran, Wyatt Earp. It will be a moment that will surely never leave the psyche of the Inagh-Kilnamona man, whose courage brought a county to its disbelieving, admiring feet. Podge Collins constantly salvaged possession, whatever the odds, while his 44th minute point, from under the Cusack Stand, resembled a great work of sporting art. His club colleague, Conor Ryan, started his fourth senior championship game for Clare. What a man. Ryan’s ball-winning ability and physicality discouraged Cork from entering his zone while, in the first half particularly, Pat O’Connor and Brendan Bugler hurled themselves to the bone. Davy Fitzgerald and his mentors will be justifiably proud of how their players stood up and must be given boundless credit for preparing this team. Clare played with a freedom and intensity that has been accorded the respect and admiration of the nation. Yet, in the days ahead, particularly from next week, they will analyse in forensic detail what worked and what did not. While Clare clearly out-hurled Cork, they can improve. They need more from Colm Galvin, Darach Honan, Conor McGrath, John Conlon and Tony Kelly. All of them contributed to Sunday’s performance but they are capable of taking it up another notch. The consensus afterwards was that Cork have the most room for improvement. That’s not necessarily the case. Clare were superbly prepared, psychologically and physically and can exceed that pitch. Why? Simply because now they know that they are a better team than Cork and have proven that for 71 minutes. They don’t have to convince themselves of that. The proof is on the DVD and, more importantly, in their memory banks. The absence of a goal was probably what cost Clare the win and perhaps Cathal McInerney might come into the equation in this regard? Goal-scoring is the Cratloe man’s specialist subject, while his temperament is conducive to All-Ireland replay evening pressure. Another fact Clare will consider is that the removal of the sweeper was followed by the concession of three goals inside 35 minutes. Is there a link? It’s impossible to consider Conor Ryan playing better had he a sweeper behind him but perhaps deploying Pat Donnellan in the role, even intermittently, should be considered. Aaron Cunningham and Seán Collins may be fit enough to be considered, while the drawn game will also have helped Cork’s Brian Murphy, following his return from a shoulder injury. During his after match press conference, Davy Fitzgerald hinted his displeasure at Brian Gavin’s decision making but didn’t mention specifics. Gavin should have red carded Shane O’Neill following his incident with Darach Honan in the opening half, while David McInerney was clearly fouled, yet Clare had a pointed free awarded against them. But getting bogged down on the referees performance won’t help Clare. The replay canvas is blank and won’t be touched until 5pm on September 28.